On Abyei, Rice Complains of Blocked Visas, Sudan Says "Ethiopians Only"
UNITED NATIONS, February 9 -- Abyei was the subject of a UN Security Council closed door meeting Thursday. 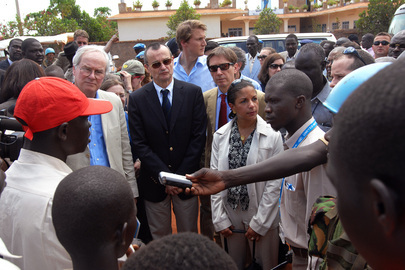 Afterward Inner City Press spoke exclusively with Ambassadors Susan Rice of the US, Daffa-Alla Elhag Ali Osman of Sudan and David Choat of South Sudan, hearing quite different stories. Ambassador Rice began by saying there remain problems with "the government" of Sudan "preventing visa." Inner City Press asked if the UNIFSA mission has a human rights components. Rice answered that the Council was briefed that the government was "open to one;" but Daffa-Alla Elhag Ali Osman said this was not an authorized statement. Daffa-Alla Elhag Ali Osman went further, telling Inner City Press that he was told yesterday by a member of the UN panel on Darfur sanctions that when the member asked for access to South Sudan to check on Khartoum's allegation that the Justice and Equality Movement rebels had entered South Sudan with weapons from the collapsed Gaddafi government of Libya, "the government of South Sudan blocked me and didn't give me access." David Choat, when Inner City Press asked about this, challenged Daffa alla to name which South Sudan ministry or minister had denied access. Choat said that the Sudan Armed Forces is still present in Abyei, and that this prevents the return of internally displaced people currently on the South Sudan side. He said that from South Sudan, only police remain, waiting to be part of the Abyei administration. Daffa-Alla Elhag Ali Osman emphasized that of UNISFA's authorization of 4200, already 3800 are there. Inner City Press asked if these are all Ethiopians, and Daffa-Alla Elhag Ali Osman said yes, "all of them are Ethiopians.". He said, "those who are talking about visas are giving wrong messages. We and the other parties agreed that the component should be exclusively Ethiopian." So whatever happened to the talk of human rights monitoring and a civilian component? Choat said, "the troops are Ethiopians but there should also be" internationals in the civilian component. UN Peacekeeping's Edmond Mulet came out, and Inner City Press asked if there was yet a Status of Forces Agreement for UNISFA. Mulet said it is still being negotiated, with both North and South Sudan. Daffa-Alla Elhag Ali Osman didn't disagree, calling the SOFA "a little thing" but saying that under the CPA, "Abyei until and unless final settlement is reached is in the North." Inner City Press asked again about the incident in which four Ethiopian peacekeepers bled out after landmine injuries, unable to get medevac to Wau in South Sudan. Daffa-Alla Elhag Ali Osman said that permission was given in two hours in that case, "and it was a holiday." There is the still murky issue in South Sudan of how long the UN knew it had no military helicopters before the lack played a role in failing to protect civilians from "hundreds" of deaths in Pibor in Jonglei state -- but that's another story, as is the strike by national staff at UNMISS, on which Inner City Press has asked for the UN side. Watch this site. Footnote: While the Abyei consultations and then these interviews went on, several Deputy Permanent Representatives met to thrash out a statement based on Humanitarian Valerie Amos' briefing of January 17. Sources tell Inner City Press the sticking points concern referring to government restrictions on aid, and SPLM-North complying with commitments. We'll see.